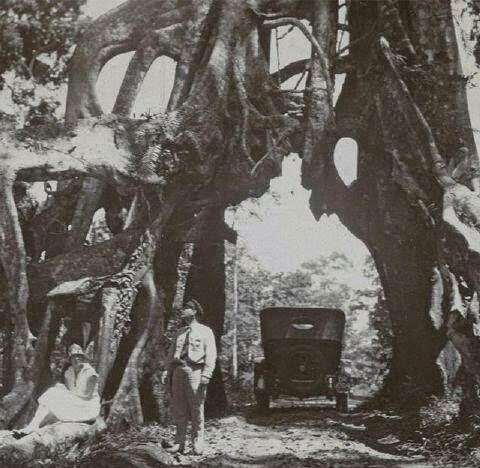 Bunut Bolong tree known as the big banyan plants with holes like a tunnel at the base. The tunnel is made to be traversed by vehicles. As if growing in the middle of the street and forming the tunnel itself. 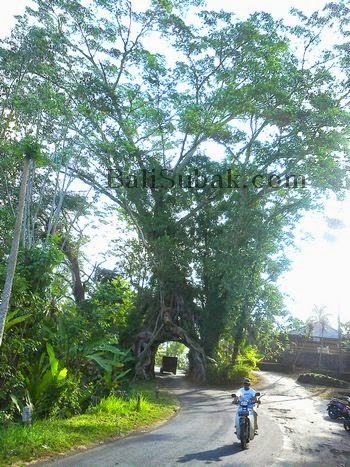 Bunut Bolong is located in Pekutatan has existed since time immemorial. The age of the plant is estimated to have reached hundreds of years. Age can be measured by the diameter and height. Since the colonists were in Bali, this plant has been known. When invaders exploit Bali residents to plant herbs, plant remains are left alive, although its presence is blocking the process of making a road through the clove plantations at that time. In the photos it looks two strangers who were posing under Bunut Bolong that the very large size. With a car, the car looks artificial 1930s. It is estimated that the two men were part of the occupiers who was then being exploited people of Bali for growing spices. When the photo was taken, Bunut Bolong already very large. It could be argued regarded as one of the oldest plants with age in Bali. Currently the area around Bunut Bolong has become a village with a population that is quite a lot. The village also named the same as the large plants, Village of Bunut Bolong. If the Balinese speak and hear the word Bunut Bolong, it will cross the minds of a large banyan plants in the middle of the street, with a large hole that can be passed by the vehicle. Take a look at the comparison photos taken of yore with those taken today. It is seen that the size of the tree is very large at the time. There was no difference in the shape of a large root at the bottom of the tree. Just a different color images, as well as a small number of roots more in photos taken at this time.